Not to be confused with Boo Guy, Ghoul Guy, or Polterguy. Ghost Guys (originally known as Shy Guys) are ghosts that appear in Luigi's Mansion. 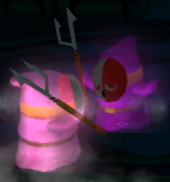 They appear in a multitude of colors, wear eyeless Shy Guy masks, and are equipped with pitchforks resembling those carried by Beezos from Super Mario Bros. 2 and the non-Mario game Yume Kōjō: Doki Doki Panic. When Luigi uses the vacuum on them, the masks come off revealing two yellow eyes and a small black hole for a mouth that are actually set on the hoods that they wear. Removing their masks also allows them to be stunned with the flashlight and vacuumed. They have 20 HP. There are two types between the colors: red and green Ghost Guys wear plain white masks and will pursue Luigi slowly, jabbing at him when close enough; pink, purple, orange, yellow, and white Ghost Guys wear red and white masks with drawn on mustaches, and dance in pairs in a circular motion, with one occasionally swinging its spear in a circular motion for the other to duck under. 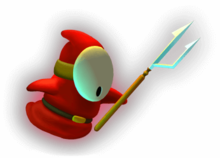 This type is called a Dancing Ghost Guy in the remake. If Luigi captures one in a pair, its partner will pursue him like the red and green types, except spinning instead of jabbing. A group of dancing Ghost Guys appear on the Roof near a fire, and in the Ball Room, where the Floating Whirlindas appear after Luigi catches them. Heipō A portmanteau of Heiho and the Chinese word "po," meaning soul. Romanized as "Heypo" in the game's code. Aside from the colors seen in-game, there are unused models for cyan and blue versions. The noises produced by Ghost Guys, particularly the dancing ones, are recycled as the primary noises for Shy Guys in general in later games. This page was last edited on January 28, 2019, at 20:44.